Updated to add: Oops, word on the street is that some folks can’t see Flickr. Previous Post Rubs and Rolls. It’s only the greatest shirt ever! We smile every time we see it. Really. I think you can get them at wrybaby.com. 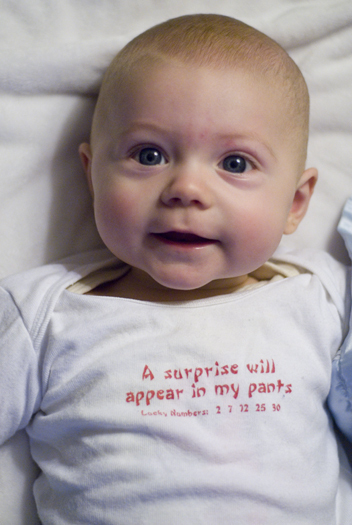 Super funny baby clothes! I haven’t checked your site in a long while, but WOW what a beautiful kid!! OK, is that a baby model?? haha, thanks you guys. He’s a wonderful little person.